Advanced technologies allowed to create alternative types of fuel which are renewable, completely burn down and are more reliable, than traditional gasoline. First of all it is ethanol. Biofuel received by fermentation practically any substance containing starch or sugar — grains, potatoes, sugar cane, girasol, other agricultural plants, production wastes of foodstuff and drinks. Researches revealed opportunity to make ethanol also from cellulose which contains in wood, in corn stalks, a rice peel and millet. Production of bio ethanol is capable to stimulate substantially agricultural production, economy and to improve state environment. Bio ethanol is the one of the most important representatives of one-nuclear alcohols. This colorless liquid which mixes up in any ratios with water, alcohols, air, glycerin, gasoline and other organic solvents, burns with a colorless flame. Ethanol, possessing high octane number and power value, it is an excellent motor fuel. For receiving 95 gasoline it is required to add about 10% of ethanol in 92 gasoline. In all European countries ethanol upgrading with gasoline is provided at the oil processing enterprises, add in the necessary proportion fuels of an additive stabilizing structure therefore its quality and safety for cars are guaranteed. Growing interest to alternative types of fuel is caused by three essential reasons: alternative types of fuels give less emission strengthening smog, air pollution and global warming; the majority of alternative types of fuels are made from renewable resources; use of such fuels allows to increase power independence and safety. Application of various oxygen containing additives (alcohols, air) as anti-detonators has a number of advantages. From various anti-detonators, available and environmentally friendly ethyl alcohol is the most effective alcohols, in particular. Ethanol upgrading allows to underestimate several times quantity carbon oxide and nitrogen emissions, and also oncogenic connections. That is the problem of the translation of vehicles operation is actual for increase of ecological and energy security on use of ethanol and biodiesel motor fuel from own renewable raw materials. Use of such fuels allows to increase power independence and safety. There are two methods of alcohol application as fuel for automobile engines – at partial (to 20%) and at full replacement of gasoline and diesel fuel. High anti-detonation qualities define primary use of alcohol in internal combustion engines with compulsory (spark) ignition. The standard engine doesn’t need to be remade for work on mix. In some mixes the percent of ethanol reaches 85, and in this case fuel is called E85. There are vehicles which can work at mixes with different ratios of gasoline and ethanol. The sensor connected to the computer, regulating operation of the engine, defines percentage of ethanol in a fuel tank and respectively arranges the engine. One gallon run in case of gasoline mix use with ethanol is some percent less, than run on one gallon when using clean gasoline because ethanol upgrading has the smaller power density (calorific ability), than gasoline. Extent of manifestation of this effect depends on an ethanol and gasoline ratio in mix: the more ethanol, the run is shorter. In all European countries gasoline mixes up with ethanol at the oil processing enterprises, add in the necessary proportion fuels of an additive stabilizing structure therefore its quality and safety for cars are guaranteed. Growing interest to alternative types of fuel is caused by three essential reasons: alternative types of fuel give less emissions, air pollution and global warming; the majority of alternative types of fuels are made from renewable resources; use of such fuels allows the state to increase power independence and safety. 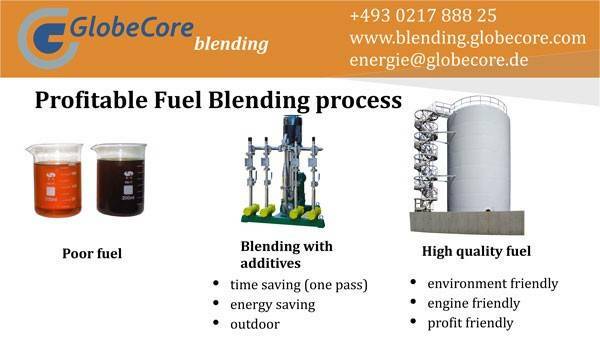 Globecore Blending company is intended in production of fuel blending systems. These systems are manufactured as stationary and mobile execution (the mobile can be mounted on trailers and semi-trailers, vans and railway platforms and as any other mobile means). Production of all units is coordinated with the customer and generally made under individual requirements depending on demanded final product. If you want to reduce expenses of you company for fuel production, “USB” cavitation blending system could help you to do that. To receive extra information contact us and technical manager will call you back or download inquiry list and receive free catalog.